After a successful summer edition of Texworld USA, one of the largest sourcing shows on the East Coast will return to the Javits Convention Center from 21-23 January 2019. Texworld USA has positioned itself as a must attend industry event and business platform bringing together the best international apparel fabric, trims and accessory suppliers in the heart of New York City. Texworld USA provides a stage for the industry to explore high quality apparel fabrics, trims and accessories at a reasonable price. The show features over 16 product categories, ranging from knits and functional fabrics to cotton, denim and more. Attendees will also find the most cutting-edge information on trends in textiles, the opportunity to network with manufacturers and suppliers, as well as gain new knowledge from an assortment of complimentary educational sessions that cover chemical free dying processes, effects from tariffs, China’s take on sustainable solutions and more. “Our exhibitors, now more than ever, know the importance of speed to market as well having the ability to supply eco-friendly sourcing options to retain and obtain buyers. Manufacturers are starting to see this as a requirement and not just an option due to increased global concerns about business practices,” said Jennifer Bacon, Show Director, Fashion & Apparel. Local Loft will also return for the winter 2019 edition featuring domestic and local suppliers focusing on low minimums. Attendees will also benefit from a new line-up of Textile Talks and Explore the Floor featuring discussions relevant to technology, fabric innovation and more - all on the show floor. Visitiors can also gather inspiration through Texworld USA's trend showcase that will feature exhibitor textiles that are trending for the season. Texworld's educational seminar series, organised by Lenzing Fibers will return for Winter 2019 featuring sessions hosted by industry experts. 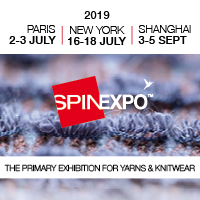 “During this time in which the apparel industry faces many sourcing challenges, we look forward to a robust Texworld USA supporting alternatives and solutions for the market,” commented Tricia Carey, Lenzing Fiber’s Director of Global Business Development. As one of the only events in North American to focus on sourcing finished apparel, contract manufacturing and private label development, Apparel Sourcing USA Winter 2019, collocated with Texworld USA, will welcome exhibitors specialising in over 21 product groups as well as a focus on sustainability as the Spotlight.